Welcome to Blue Lake Preschool! 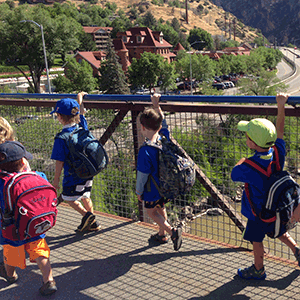 Blue Lake Preschool is a board-governed non-profit organization dedicated to enriching the lives of children and their families in the Roaring Fork Valley. This Website and the Parent Handbook (PDF Download) should answer most of your questions regarding the policies and programs that make Blue Lake Preschool so valuable for families. If you have any questions that are not covered in this handbook, please do not hesitate to speak with the Center Director(Contact Us). We want you to be happy with your decision to choose Blue Lake Preschool as the place for your child to learn and grow! Studies continually conclude a consistent routine, quality teachers and lower student-teacher ratios are a strong foundation for providing an enriched classroom environment for our children. We pride ourselves in hiring teachers who are compassionate, enthusiastic, and dedicated to their role as a professional in early childhood education. We provide funding for our teachers to take additional college courses and reserve two in-service days where the school closes to prepare for the upcoming school year. We also close one day each January to meet with you to inform you of your child’s behavior, progress, and social and physical needs. Blue Lake Preschool is continually rated by Qualistar and you can find those results as well as helpful information on selecting childcare that is right for your family at www.Qualistar.org. Blue Lake Preschool is licensed by the State of Colorado. We are inspected regularly to ensure that we meet or exceed health, safety, and other state requirements. Blue Lake Preschool is an equal opportunity provider. We accept applications for admission and employment without regard to race, religion, gender, national origin, color, creed, physical or mental disability, sexual preference, or any other protected status.